Rabbit Hutches - Tips on keeping your rabbit safe if housed outdoors. Rabbit Hutches - How To Keep Your Pet Rabbit Safe and Happy Outdoors. Rabbit hutches are used to keep your pet rabbit outdoors, it’s important to have the correct hutch for him to live in. Rabbit hutches that are made correctly will keep your rabbit happy and safe year round. You have to be careful of the pesky predators that live in your area. That could be raccoons, cats and dogs. There are two styles of hutches that bunny people have used and love for their rabbits. There is a wood and wire style and an all-metal style. Rabbit lovers like the wood and wire hutches because they stay cool in the summer and warm in the winter. 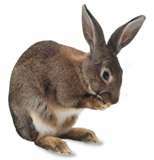 The draw back is that rabbits love to chew on the wood and these styles can be difficult to clean. The all-metal hutches are easier to clean but can be hot in the summer and cold in the winter. However, some breeders use this style because these hutches can be stacked. Whatever style you choose, make sure you get the correct size. The recommendations are that the hutch should provide a minimum of 1 square foot of space for each pound of rabbit. So if your pet rabbit weights 5 pounds, then the hutch should be a minimum of 5 square feet of space. You could always have more space than the minimum recommendation; your rabbit will love it! Do not use a hutch that is made up of chicken wire. Chicken wire is not strong enough. Use a hutch that has wire mesh which is strong enough to keep your rabbit safe from unwanted visitors. Your rabbit might try to chew the wire and if it is not strong enough, he will make a hole in his hutch that he could possibly escape and harm himself. Or let unwanted visitors inside to harm him. Secondly, make sure the wire on the floor is small enough so your rabbit does not get his foot caught in it. The wiring should not be any larger than 1 inch by 1-½ inches. You want your rabbit’s droppings and urine to fall through the flooring but you do not want his foot to get caught. I would also suggest putting a piece of vinyl title or something similar, into the cage so your rabbit doesn’t have to lay or sit directly on the wire all the time. The home improvement stores allow you to buy just one title and the vinyl is easily cut to fit your hutch. The whole wire flooring doesn’t need to be covered, just a section so your rabbit can sit on something that is comfy. Make sure your rabbit hutch protects your rabbit from the weather and other animals. Your rabbit should feel safe and secure in his home so make sure the hutch is a well-constructed unit. Protect your buddy from the hot sun in summer and the cold in winter. During a windy rainstorm, make sure the rain is not coming in from the sides of the hutch. The unit should have a pitched roof so the rainwater runs off. Have solid side panels or canvas coverings for the hutch to stop the rain and cold from coming in. And don’t forget the sides on a windy day. You want to make sure your rabbit feels safe at all times. Make sure the rabbit hutch is up high enough so the critters cannot harm him. Raccoons, dogs and cats will smell your rabbit and come over to check him out. Make sure the unit is several feet off the ground and secured so a critter cannot push the hutch over. Let’s not forget the nesting box. Place a nesting box inside the hutch so your pet rabbit will have someplace to go to feel safe or just to hang out. Don’t forget that rabbits are very sensitive and loud noises will upset them. They like to have someplace to hide. Straw is important for their nesting box for comfort and warmth, as well as placement of the rabbit hutch. Rabbits are also very sensitive to extreme heat, temps over 80 degrees, and so make sure the unit is placed in a well-shaded and ventilated area. Remember to place a frozen large water bottle, 2 liter, or a frozen “blue ice” in the cage when the weather gets warm. The frozen bottle will help keep your rabbit cool and comfy in the hot summer months. Keep a few frozen bottles handy so you can replace the bottle as soon as it gets warm. I have those “blue ice” packs that people use to keep things cold in coolers. I have 5 packs that I keep frozen and as soon as the pack gets warm I replace it with a frozen one. This way Oreo stays nice and cool during the hot muggy days of summer. I don’t have an air conditioner in my home so the “blue ice” comes in handy for him. When it gets in the high 80’s, I usually use 2, maybe 3 “blue ice” a day for Oreo. When it’s cold outside make sure your rabbit is also comfy. Add extra straw to his nesting box and add the side panels or canvas shades to block the cold from entering the hutch. If possible, maybe you could move the hutch during the winter months to an inside area for added protection. Like a shed or outside building. Be careful of a garage, since there’s the car exhaust to worry about. Take a look at your local pet store or farm supply store for their ready-made hutches that are available. Your pet rabbit or rabbits are depending on you to keep them safe and happy. When considering to keep your rabbit outdoors please remember these important tips when looking at the rabbit hutches available. Your bunny will thank you for it.